I thought I’d take a whirl through the UK websites of the Japanese big three automotive companies. 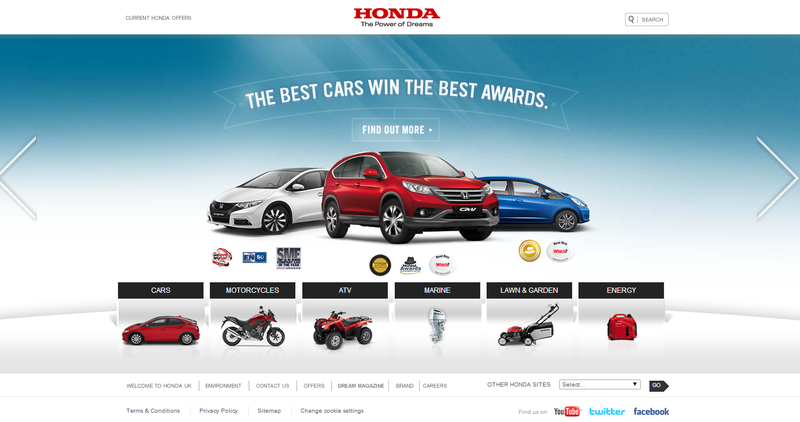 What do Nissan, Honda and Toyota’s websites handle like for first timers? Well, they might be known as the big three, but it’s the big two and a half as far as web design is concerned. For some detail on automotive and social media, check out these posts. Just look at that. First time visitors like me are inundated with no less than four features that immediately demand attention but don’t really help with Nissan’s bottom line. I’m asked to accept cookies. This notification is far too large in my opinion. I’m twice asked to allow Nissan to use my location. Surely once will do for this initial encounter? I’m also told my opinion counts, but surely this box is not optimised? There’s a lot going on and I have to click on ‘why take part?’ to learn of an incentive. I was assigned my correct location (roughly by IP) and the dealership finder worked well. However, I was less successful in booking a test drive. Although taken to the nice page below, I couldn’t click on any of the models, commercial or passenger, and so I could not continue. I tried this with another location and another browser and still didn’t succeed, so this could perhaps be a bug with the entire system? Not good. The dropdown menus from the header worked well for me (as long as you only click on the dropdowns, as the header is unclickable despite the pointer changing to a hand), however I’m unsure what the point of the popout information on each model is. The text is far too small for me and I have 20:20 vision, sir. One disadvantage of those dropdown menus is I’m left thinking there’s nothing below the fold. I was actually surprised when I saw an arrow at the bottom of the page, winking downwards and hinting I should scroll. This happened once when my cursor was in the area and never again. Scrolling down I find this screen displaying the range of passenger vehicles on offer. This is what I’d like to see when I land on the homepage. It does the job and has scrollover calls to action that work well. Other features that need improving are – well I’m not being unkind here – quite a few of them. I have to scroll to the bottom of the site to request a brochure. The product pages don’t show off the cars and the text is both too much and too small. Once I’ve clicked on ‘main features’ I get a better page that’s easier to take in, but perhaps I should be taken here to begin with? The product pages feel like a website embedded within an iframe and surrounded by older clunkier menus. I imagine this is part of the challenge of creating websites internationally for a big car manufacturer that probably has a decent sized code base. 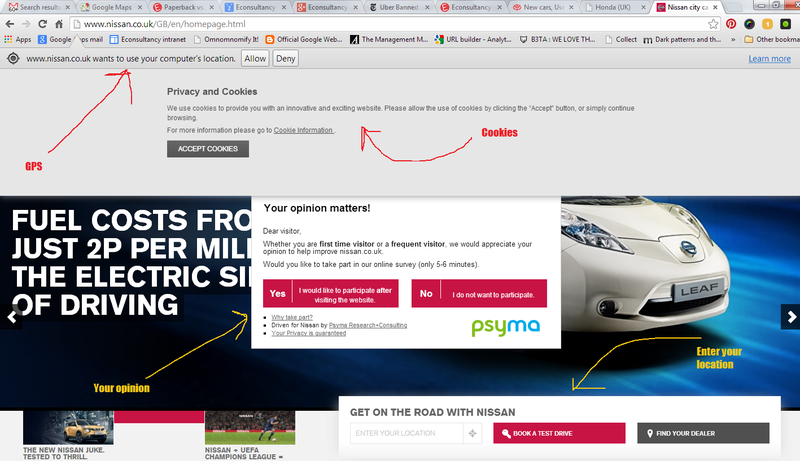 One gets the sense that Nissan is aware of the problem with functionality, as I was served a pop out (at random, it seemed) test drive form to add my details, when I was browsing a model. This is probably necessary given the deficiencies in other areas. You can see a screen shot below. A fairly simple but effective homepage. The three most common actions and the ones the manufacturer wants to be taken are highlighted in red at the top. These functions all work well and I like the way a brochure can be ordered through the post, via email or now, as a PDF. The menu is much more like it (compared to Nissan) with good pictures and pricing. Toyota also has better messaging than Nissan. If I select the big photo of a Yaris in the middle of the page I’m taken to a similar looking page for the Yaris but with common sense calls to action that are aimed at the consumer. Which Yaris is right for you? Find out more about Hybrid. 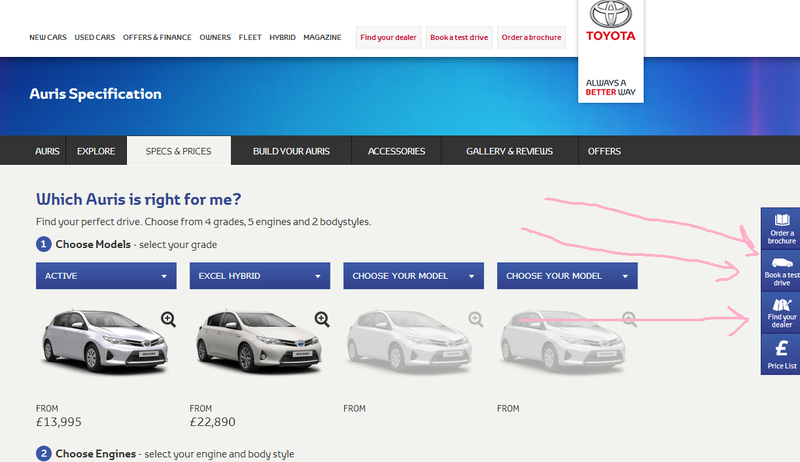 Toyota is using a live chat pop up on its hero Yaris page. The product pages always make the consumer aware of those three important options – test drive, brochure, dealership. The homepage is very simple and doesn’t just focus on automotive. Each button at the bottom corresponds to a different product line – cars, marine, garden etc. However, the main carousel image focuses on cars, naturally. Selecting ‘cars’ there’s a familiar mini top menu allowing for brochure, test drive and finding a dealership. The messaging on this page is the best yet – ‘Looking for a new Honda?’, ‘Already a Honda owner?’ etc. The key here is ensuring that the user doesn’t have to think too hard. The menu is not as expansive as Toyota’s but it’s efficient and the pictures work well. Again it can be clicked (!). And the product listings look modern, too. Take a look around these three websites and you’ll see Toyota and Honda are remarkably similar and they do their jobs confidently. Nissan, though, feels a long way behind. Let me know if you’ve seen any great automotive websites out there, or ones that need a bit of touch-up paint. How can APAC’s low cost airlines improve the flight search UX? A survey conducted by Econsultancy way back in 2011 found that three quarters of travel research takes place online. It’s likely that this number has increased since then, however many travel sites are still lagging behind when it comes to the online user experience. In Europe budget airlines are finally waking up to the fact that passengers expect websites to offer a decent UX, with easyJet and Ryanair both taking steps to upgrade their desktop and mobile platforms. But is the same true in APAC? To find out, I searched for flights with several low cost airlines, including AirAsia, TigerAir, Jetstar and Firefly. Read to find out what I discovered, or for more on this topic read Econsultancy’s State of Ecommerce in South-East Asia Report. Three’s a crowd, and I’m not referring to failed 80s sitcoms. I’m talking about customer relationships. Yet according to a study by the UC Berkeley Center for Law and Technology, 85% of the top 1,000 websites have cookies set by a third party. Propelled by widespread anonymity in the early days of the Internet, third-party cookies have undoubtedly become a staple for many marketers, tracking consumer behaviors across the web with the promise of uncovering invaluable insights. Not only is this an invasion of consumer privacy (more on that later), but it also prevents businesses from truly knowing and understanding their customers. First-party data, transparently collected via voluntary user registration, on-site activities and interactions, removes data brokers as middlemen, establishing direct brand and consumer connections and fostering 1:1 relationships. Let’s take a look at three ways that third-party cookies are hurting your customer relationships, and how first-party data can be collected and used to improve audience understanding and user experiences. What makes a great ecommerce product page? I’d say it’s a blend of several factors, including usability, use of images, reviews and clear information for shoppers. Here I’ve rounded up some more excellent examples, with the intention of highlighting some examples from less mainstream sites.